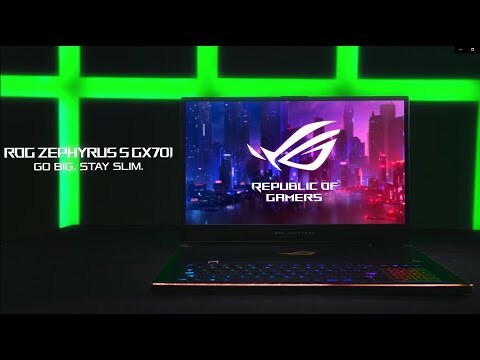 ASUS ROG Zephyrus S GX701 17"
Go Big, Stay Slim. Gain Advantage. The ASUS ROG Zephyrus S is kitted with the new GeForce RTX 20-Series with Max-Q Design GPU and a powerful Intel Core i7 processor. With a super narrow bezel and elegant design, ASUS have squeezed a 17 inch display into a chassis just 18.7mm thin. This is the ultimate ultra-slim gaming laptop with 144Hz refresh rate and a 3ms response time this Full HD gaming laptop features colour accuracy with ProArt™ TruColour Technology, which delivers Pantone validated colours allowing you to work and play on one machine. You can swap between Gaming and Optimus mode to bring out the true power of the ROG Zephyrus or save battery for a longer lasting charge. The Built in Range Boost Wi-Fi gives you 30% wider coverage than dual antenna configurations and allows for a more stable connection for online gaming. 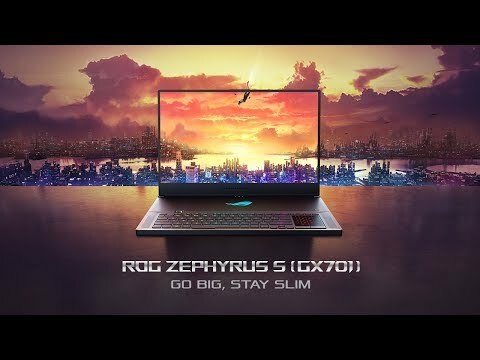 THE MOST COMPACT 17-INCH GAMING LAPTOP EVERImmersing yourself in a larger display usually means lugging a larger laptop, but slim bezels and smart design make ROG Zephyrus S the smallest in its class. Easily carry it around town or across the world thanks to compact dimensions that put a 17-inch display in a 15-inch form factor. The sleek magnesium-alloy body fits inside standard bags and is strong enough to stand up to everyday life. accurate colour calibration for the creatorsSlender bezels draw you deeper into the action on the 144Hz IPS-level display. The high refresh rate makes gameplay smoother and lowers input lag, while the 3ms grey-to-grey response time produces sharper visuals with no blurring. Colour accuracy and uniformity are crucial for content creators, designers and artists, so factory calibration and ProArt™ TruColour Technology deliver a Pantone® Validated palette. 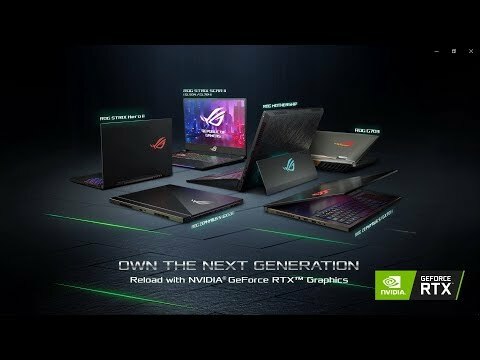 Powered by NVIDIA with Max-Q Design Available with up to NVIDIA GeForce RTX 2080 with Max-Q Design graphics, ROG Zephyrus S is on the leading edge of GPU technology. The revolutionary NVIDIA Turing architecture mixes traditional CUDA cores for programmable shading with RT cores for ray tracing and Tensor cores for AI. Together, they enable more realistic lighting, shadows, and reflections in real time to make games more immersive. Super-Fast 8th Generation Intel Processor ROG Zephyrus S features the latest Intel Core i7-8750H. 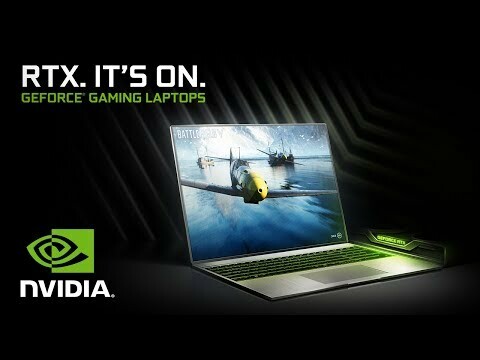 Its six cores and 12 threads via Hyper-Threading provide 50% more cores than the last generation, allowing effortless gaming with simultaneous recording and live-streaming. Intel Speed Shift and Turbo Boost balance power and efficiency, pushing the processor up to 4GHz for quad-core loads and 3.9GHz with all six at full throttle. HIGH-SPEED HYPERDRIVE STORAGEGames, applications, and large files load at warp speed on the NVM Express (NVMe) SSD. ROG HyperDrive storage uses up to four PCI Express (PCIe) lanes to achieve amazing throughput. Comes with an upgradeable 1TB of storage which leaves loads of space to install everything you might want to play, with plenty of room left for the rest of your life. DUAL-CHANNEL DDR4 MEMORYROG Zephyrus S uses DDR4 memory optimized for high speed and low power consumption. The dual-channel config is clocked at 2666MHz, yielding an 11% performance increase over 2400MHz RAM. With up to 24GB under the hood, there’s enough RAM to multitask while gaming. Stays COOL UNDER PRESSURE The unique ROG Active Aerodynamic System expands to help ROG Zephyrus S sustain high GPU clocks with demanding games. Lifting the lid opens a 5-mm intake that increases airflow by up to 22% compared to traditional designs. Anti-dust tunnels keep the four heatsinks clean to preserve cooling performance and system stability as the hours add up. With high-performance dual fans running on 12V power it lets them spin faster, improving airflow compared to typical 5V fans. The expertly tuned system profiles let you quickly adapt to different scenarios using a convenient keyboard shortcut. With the highest fan speed and frequencies, Turbo mode is the best for maximum performance. sync up your compatible gear The keyboard ensures precise input in the heat of battle, and it’s built to last. You can customize the backlight colours and effects to suit your style, and another configurable RGB zone illuminates the Active Aerodynamic System intake at the back. Aura Sync harmonizes lighting across compatible ROG mice, headsets, and other peripherals to give your setup a cohesive look. AMP UP YOUR AUDIO Clever software lets ROG Zephyrus S simulate surround-sound environments for stereo headsets, putting you right in the middle of the action. This versatile capability works with not only analog cans, but also USB and VR headsets that typically don’t work with virtual surround sound. Extra Flexibility with More Bass and Range Control Smart amplifier tech keeps the speakers within thermal and excursion limits when you spin the volume roller, so you can turn it up without harming the cones. The amplified output is louder, with more bass and range that help you hear enemies on the battlefield, dialog in videos, and subtleties of your productivity soundtrack. Plug in a headset for immersion, and go deeper with virtual surround sound. Full Performance G-SYNC ModeG-SYNC mode synchronizes the GPU and display to deliver smoother gameplay with lower input lag and tear-free graphics. Power Saving Optimus ModeOptimus mode selectively turns off the discrete GPU to save power with everyday desktop productivity and entertainment. 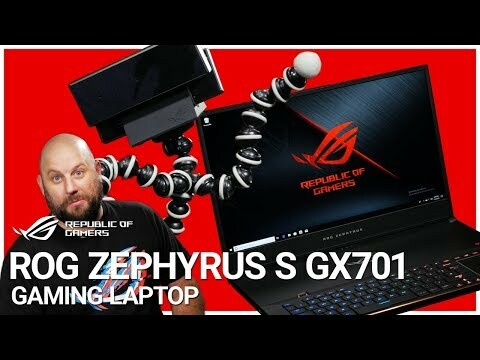 COMPREHENSIVE CONNECTIVITYROG Zephyrus S has all the connectivity needed for gaming and working on the go. One Type-C™ (USB-C™) port is available at USB 3.1 Gen 1 speed, while one Type-A port offers faster Gen 2 connectivity for devices that can keep up. Additional Type-A ports are perfect for a gamepad, mouse, or USB storage. HDMI 2.0 supports 4K UHD displays up to 60Hz, so you can game and entertain on big-screen TVs. TAP INTO TYPE-C CHARGINGROG was first to support both DC and Type-C charging on gaming laptops. USB Power Delivery lets Zephyrus S charge from portable power packs, so you don't have to find a socket when the battery gets low. Fast-charging support reverses the flow, using up to 3A to quickly revive smartphones and other devices. You can also do everyday work with a smaller 65W adapter that lightens your load on the road. UNIFIED SYSTEM TUNING AND PERSONALIZATION ROG Armoury Crate unifies system and lighting control to put essentials at your fingertips in a single utility. You can easily change settings for both and define up to four game profiles that automatically make adjustments when you launch your favourite titles. These options are just the beginning for what will become an even more versatile tool. Full HD detail at a smooth 60 FPS Upgrade your stream with the ROG GC21 external camera. It captures crisp Full HD detail at a silky 60 FPS that makes movement smoother and more nuanced. Despite doubling the frame rate of conventional cameras, ROG GC21 folds to just 17mm thin and slips easily into a pocket. Position the USB-connected camera anywhere for the perfect angle, and be heard clearly by the beamforming microphone array. COMPREHENSIVE COOLING COVERAGE Five heat pipes snake beneath the surface to pull heat away from not only the CPU and GPU, but also the circuitry supplying them with power. This design keeps the power components under 80°C, which helps improve long-term reliability. The CPU and GPU connect to both shared and dedicated heatsinks to ensure efficient cooling for any workload. MORE ULTRA-THIN FINS Thermal energy is dissipated by four heatsinks in the flanks. Each one is lined with ultra-thin copper fins as slim as 0.1mm, allowing higher density and lower air resistance than typical fins that are twice as thick. There are 250 heatsink fins totalling 110,000mm2 of surface area, and the ones on the sides are angled slightly toward the back to direct warm air away from your dominant hand. SELF-CLEANING COOLING SYSTEM Keeping the heatsinks free of debris is critical to maintaining optimal thermal dissipation, so our engineers designed a special anti-dust tunnel that catches and channels particles outside the chassis to prevent them from collecting on the fins. This self-cleaning system helps ensure consistent cooling performance, which improves long-term stability and reliability. MORE BLADES INCREASE AIRFLOW AeroAccelerator technology maximizes airflow inside the slender chassis. The carefully shaped aluminium intake shrouds use curved edges and raised guides to help the fans draw in more cool air. Once inside, it’s blasted toward the heatsinks by liquid-crystal-polymer blades that are 33% thinner than conventional designs. ROG Zephyrus S achieves our highest-ever blade density with 83 per fan, improving airflow by up to 17%.